The New Year has just begun. This year too Bapu delivered his video address to his Shraddhavan friends through my YouTube channel in which he underlined the necessity of chanting Shree Panchmukh Hanuman Kavach. Most of us make resolutions and are determined to carry it till the end of the year. Some succeed while many of us lose the dedication as we delve into the daily routines. So, let us strive to achieve a higher level of success and make the most of it this year. The most awaited event of the month, the “Kolhapur Medical & Health Care Camp” concluded on the 23rd of January 2017. A total of 14,924 villagers including 8,672 students have benefitted in the two days of Kolhapur Medical & Healthcare Camp 2017, conducted under the guidance of Dr. Aniruddha Joshi by Shree Aniruddha Upasana Foundation, Dilasa Medical Trust & Rehabilitation Centre and its sister organizations. The end of the month marks the auspicious occasion of Maghi Ganeshotsav. 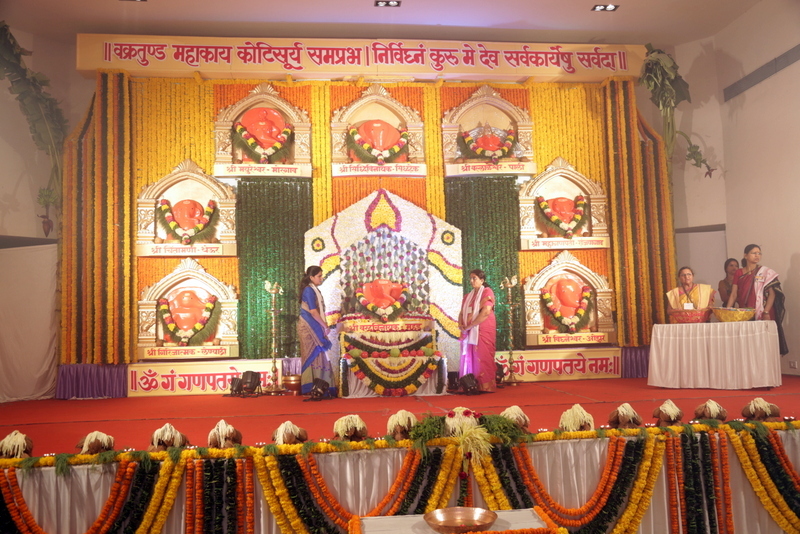 The collective pujan of Shree Brahmanaspati alongwith Shree Ashtavinayak is done under the Vedic Procedures (as laid down in Brahmanaspati Sukta). Being a part of the event is inviting into our life the grace of Shree Ganesh and sharing the joy of Bhakti. So let us make the most of this opportune moment of seeking the Darshan of Shree Vighnaharta, the remover of all obstacles in the first month of the New Year. Dr. Aniruddha D. Joshi i.e. 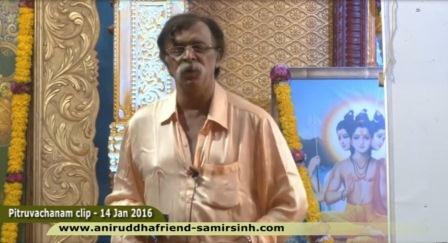 our beloved Aniruddha Bapu had delivered a lecture on 13th December 2014 on Self Health. During this lecture Bapu had spoken at length about the various foods, exercises, thoughts, etc. necessary to maintain a good health. This lecture was also an eye-opener as it made us aware of the various unhealthy practises that we were following in our lifestyles. As promised during his lecture, a website on Self Health was launched to feature all the topics and subjects that Bapu had covered in his lecture. Furthermore, other relevant topics on Self Health would also feature on this website in the days to come. This website would prove to be a boon to all those who care about their health and aspire to lead a fitter and healthier life. On the request from the authorities of Shree Mahalaxmi Temple Trust and Gamdevi Police Station Authorities, Aniruddha’s Academy of Disaster Management offered its assistance for controlling traffic and crowd at Shree Mahalaxmi Temple, Mumbai during the month of Margashirsh on all 5 Thursdays i.e. 1st Dec, 8th Dec, 15th Dec, 22nd Dec and 29th Dec, 2016. 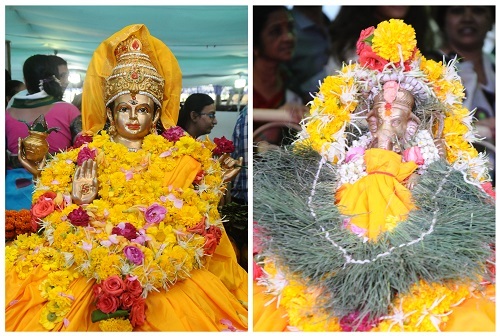 Large number of devotees had turned-up to offer prayers to their beloved deity Goddess Mahalaxmi in the temple during the holy month of Margashirsh. 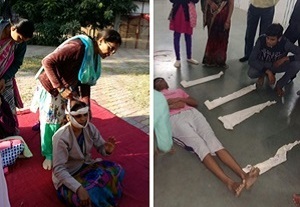 Aniruddha’s Academy of Disaster Management deployed 174 Disaster Management Volunteers during all these days. 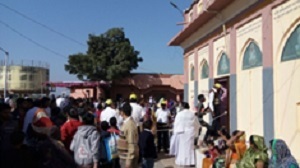 At the request of Shree Datta Mandir Trust, Sarangkheda, District Nandurbar, Aniruddha’s Academy of Disaster Management offered assistance to the Trust’s officials and Police authorities in controlling crowd, on 13th December, 17th December and 18th December, 2016 on the auspicious occasion of Datta Jayanti at Shree Datta Mandir, Sarangkheda, Nandurbad. 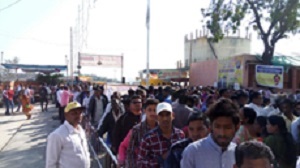 Aniruddha’s Academy Of Disaster Management, deployed 54 Disaster Management Volunteers from 6 Sadguru Shree Aniruddha Upasana Centres, viz., Nandurbar, Chhadwel, Torkheda Shahada, Kothli and Nandurbar Gujarati for controlling crowd and for providing other emergency services. Every year, on 31st December all Upasana Kendras from Raigad district carry out Raigad Fort Cleanliness Drive. 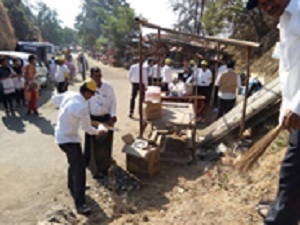 This year also 274 DMVs from 26 Sadguru Shree Aniruddha Upasana Centers participated in Raigad Fort Cleanliness Drive on 31st December 2016. This was the 14th year of this drive. Venue: Uttar Bhartiya Sangh, Bandra East, Mumbai. 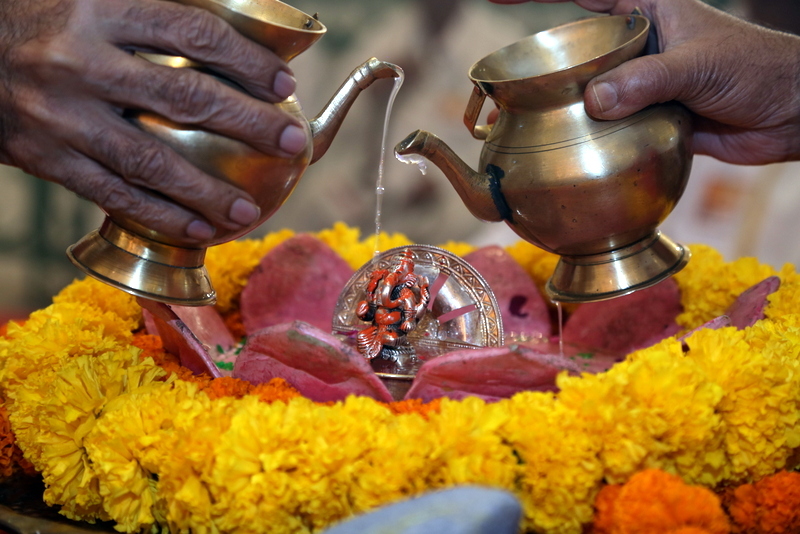 Abhishek on the idol of Shree Ganesh with waters of eight sacred rivers accompanied by the continuous chanting of Shree Ganapati Athavasheersha.